Recently, we have seen a strong push for partnership approaches in public policy, quality standards and funding guidelines. Most importantly though, evidence demonstrates that working in partnership allows agencies to deliver services that are better coordinated, more effective and more efficient. The benefits of strong partnerships are clear, but putting it into practice, is often challenging. Many partnerships struggle to get off the ground, while others fail to achieve their objectives. 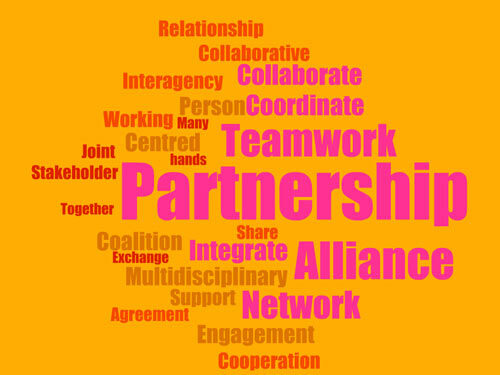 Effective partnerships are dependent on thoughtful planning, a clear vision and the right mix of members working together to achieve shared goals. Supporting change through partnerships is a core component of KPA’s work. We understand the unique challenges of working in partnership and that the ingredients for success are different for each group. Our team has extensive experience bringing people to understand their needs, establish and facilitate strong partnerships that are fit for purpose and help all members achieve their goals. We work with partnerships of all shapes and sizes, within and between agencies, sectors and across the public and private sectors. Supporting partnerships through transitions and exit.